Can anyone tell me about this Dux chair? In Furniture > Danish Modern Furniture > Show & Tell and Furniture > Chairs > Show & Tell. My uncle gave me two, without cushions. Can you tell me anything about it? I don't know anything about your type of chair but while looking on the American Picker's Facebook site, I saw a chair similar to this one called a Paul McCobb Predictor Group Chair. You may want to go on there and look yourself. It looks close to it. Good luck! Did anyone ever figure out the manufactuer /designer of this chair? The manufacturer is in the headline. These are Dux chairs. I have a DUX loveseat and matching armchair of similar design, manufactured in early 60s . They are missing the rubber belts that support the seat cushions. Is DUX still in business? Does anyone make replacement belts? Thanks. Donovan: I just saw a guy on ebay selling the straps. Look under Danish Modern. There is a store in Berkeley, The Caning Shop on Gilman. They sell the rubber Pirrelli straps and clips for most Danish Modern chairs. That's what they were called when this guy was selling them. They come with the clips. 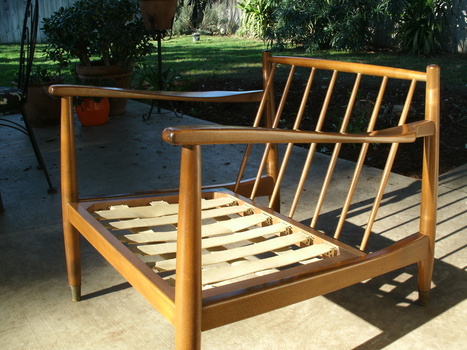 So search Pirrelli under Danish modern on ebay.